provides a cycle to walk you through the steps in building an effective legal operations function. The CLOC 2018 Conference keynote outlined below focuses on these critical and impactful competencies as pillars when developing your legal operations function, as well as other competencies as you grow the function. What’s the first thing you need to think about? Start with the big picture and what you’re looking to accomplish in your legal operations function. Your primary goal in building the function should be to enable the business. A well-defined legal operations function follows twin paths of organizational and functional maturity in its growth. Functional and organizational maturity are symbiotic and depend on each other for balance. Organizational Maturity: How mature is the organization in relation to people, process, technology, and measurement? A mature organization operates with predictability, process, and precision. Are you reactive or proactive? Organizational maturity includes building out your team and your legal operations organization in a fashion that can serve the legal department. Functional Maturity: How mature is your organization based on the prevalence of specific functional areas? As you grow, functional areas may include legal finance, knowledge management, technology implementation, vendor management, etc. The more mature your organization is along the organizational maturity X-axis, the more opportunity you have to achieve areas of functional maturity. 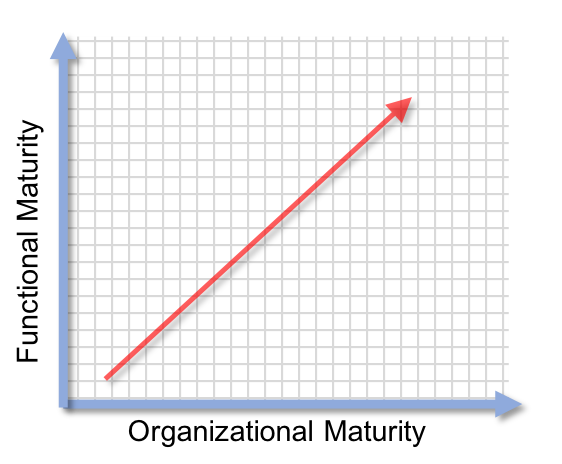 Likewise, increased functional maturity along the Y-axis will allow you to make a better business case to add more people to your organization. It’s challenging to develop both levels of maturity at the same time; however, it’s critical to keep both of these areas in mind as you develop your legal operations department. In the beginning, as you develop your legal operations function, you may be all by yourself. It’s just you trying to achieve a lot of different goals. As you grow in organizational maturity, you can begin to think about hiring additional functions, like an eBilling specialist. Then, as you develop your organizational and functional maturity, you can hire for additional functional areas. The CLOC Core Competency Reference Model is designed to show functional maturity in a cycle. Starting at the top with strategic planning, you need to work with your GC to set the strategy for the legal ops function and determine how you will build out that function. Once the processes are nailed down, you can start implementing technology to automate those processes. In the strategy phase, you need to meet with all your key business partners. This is the time to start asking questions in order to understand the issues and pain points faced by each of your strategic business partners. Supporting your business partners is a critical component of your job and you will achieve the greatest success by working in a collaborative, cross-functional way with all the business units. Ask questions that will enable you to understand each of your stakeholders’ priorities. This will help you determine how the legal operations function will drive the overall business. General Counsel: Who are our clients? Practice Area Leaders: What are your key processes? Finance: Who are the legal department’s business partners? IT: What is the universe of legal technology in place? HR: How can existing talent serve operations goals? Leverage and identify talent throughout your organization who can help you. Even if you don’t have headcount, there are resources that you can leverage in other departments. Think creatively in terms of who you want to hire for your new roles. The person you hire may not have a legal operations background, but is passionate about operations and about changing the industry. Laying an effective foundation will vary by organization and by priorities. Each of the pillars you select as your foundation will have underlying components. It can be overwhelming at first, but by focusing on the fundamental pillars in the CLOC Core Competency Reference Model, you can make manageable changes. The hardest part of the job is managing change. Things can become more painful before they get better. You might be going live with a new process or technology before the end users have fully adopted the idea. The key to change management is communication, engagement, and credibility. Communicate. Explain to both your stakeholders and end users what you are doing and why you are doing it. They need to understand “why” in order to fully engage. Engagement. Bring your stakeholders and end users on board with the change early and often. Get their feedback and ideas and make them a part of the change. Credibility. Build your credibility early in the process. Start with some quick wins that show value right away. Invoice Review: Take the first pass out of your attorneys’ hands to ensure compliance with policies and flag potential substantive issues. Workflow Automation: Firm matter, timekeeper onboarding, rate reviews, settlements processing. E-Signature: No more “Print, Sign, and PDF”. There are a number of components you can use to measure your success. Spend, timekeeper rate management, invoice review, key matter status, and law firm performance are just a few of components that can be measured. When you first come into a legal department, make sure you measure your baseline, or starting point, for your most important initiatives. As you evolve, establish milestones to show your progression and prove your success. Acknowledge that you are a service organization to a service organization. Why do organizations have law departments at all? The sole reason for their existence is to enable businesses to design, build, and sell products in a legally appropriate way. Ultimately, legal services must drive results. How do you decide where you’re going to allocate resources in your department? One way to allocate resources is to use the Core vs. 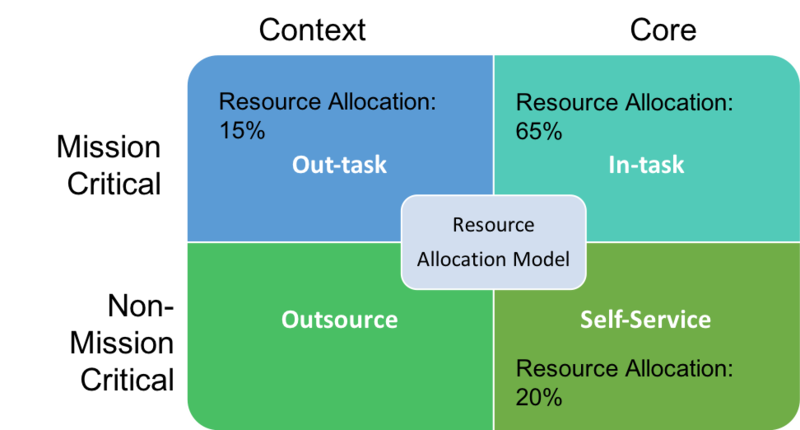 Context Resource Allocation Model. This strategic method of allocating resources will allow your company to focus on what you do well and outsource the remaining activities to 3rd party firms. First, determine which activities are mission-critical vs. non-mission critical. Second, decide if the activities are context or core. Finally, determine what percentage of your resources should be allocated to core, mission critical activities and which should be outsourced. Mission Critical: Activities that, if performed poorly, pose an immediate risk. Context: Activities that are necessary, but not tied to competitive advantage. Core: Activities that contribute to competitive advantage. High stakes litigation compliance: Mission-critical and Context -> Out-task. IP Rights: Mission-critical and Core -> In-task. Smaller litigation: Non-mission Critical and Context -> Outsource. Routine transaction processing: Non-mission critical and Core -> Self Service. The three fundamental components of culture, process, and tools must be balanced when launching your legal operations function. In order to achieve your desired outcome, you need to understand your organization’s current processes and its culture. Start with process definition. Understand how things are being done in your organization now. Define processes and map them to desired behaviors. Establish measurable metrics that are proxies for those desired behaviors. Process is going to be influenced by both tools and culture in your organization. You need to be nimble and be ready to iterate as new challenges arise. Then, address the most challenging piece – the culture. How do the people in your organization make decisions? Culture is usually set and hard to change, especially in legal departments. You’ll need to create some motivating reason to persuade people to change the way they do work. We recommend that you don’t start with tools/technology. It’s very tempting to just throw technology at the problem in order to achieve a quick solution. However, in the beginning we recommend that you focus on the narrowest set of tools that will solve the issues you face. By understanding your process and culture environment, you’ll be more successful implementing the right tools that will solve issues in the long term. Don’t make this a tools problem. Go through the exercises and develop a strong foundation. Start with process definition. Determine what matters to your organization and drive toward measurable results. Recognize that you’re not going to be successful until you address the cultural challenges. Attend a CLOC Institute to learn more about this, and many other topics of interest to legal operations professionals. Are you an in-house legal professional? Join CLOC as a member and be part of the discussion!